Hotel Aria, Prague. Aria Hotel Prague. 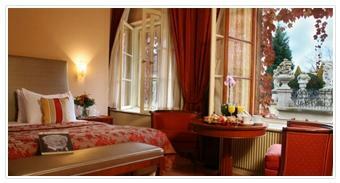 Hotel Aria is an elegant, luxurious hotel in the heart of Prague that offers a wide variety of cultural options. In the Music Library and Concierge offers a vast variety of DVD's and CD's for listen pleasure in a lovely, relaxing setting. For those organising a meeting, the boardroom will host up to 10 people for small meetings. The Screening room is the perfect place to gather in theatre style for a musical or movie previews. The fitness room offers state of the art equipment to continue any type of work out routine while on holiday. For a taste of Czech culture, the Aria Hotel presents its fabulous CODA Restaurant by Chef David Šašek, where you will enjoy contemporary preparation of international and local favourites accompanied by the perfect wine. The Aria hotel is the ideal destination for an unforgettable holiday in the romantic, incredible city of Prague.